Tokyo has a multitude of parks, but not all parks attract the same kind of visitors. For instance, Shinjuku Gyoen doesn’t allow alcohol, so it’s recommended for families, or garden/parks like Koishikawa Korakuen are more for those who want to appreciate nature quietly—no picnics or anything, just strolling and taking photos. So where do you go if you’re looking for a hip, fun park? Yoyogi Park—that’s where! Located near the JR Line’s Harajuku or Yoyogi Station, or Tokyo Metro’s Meiji-Jingumae Station, Yoyogi Park is one of Tokyo’s largest parks at 54.1 hectares. Although it was officially created as a park in 1967, it’s had quite some history. It was previously a military parade ground, and it was the site of military barracks when the US occupied Japan. It was also significant to the 1964 Tokyo Olympics: the Yoyogi National Gymnasium was created for that event, and the main athletes’ village was also in the park. In recent history, the park was also closed for some time in 2014 due to a dengue outbreak having started in that area. Today, Yoyogi Park is divided into 2 parts, separated by a road. One part is the forest park area, and another, which is a longer walk away, has an outdoor stage and stadium. The former is the larger area, and is usually where people have barbeques and picnics, while the latter’s facilities make it suitable for events—it’s virtually unheard of for a weekend to go by without an event in that part of Yoyogi Park! 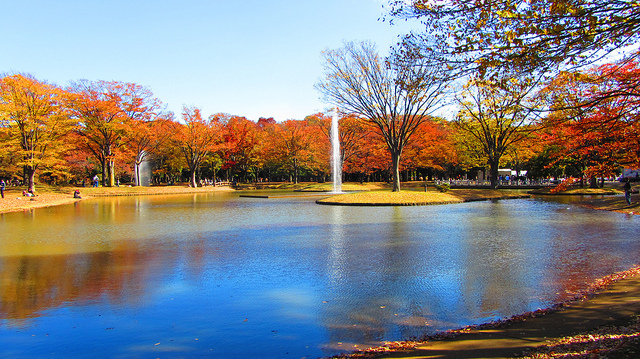 The forest park area is what most people think of when you mention “Yoyogi Park.” It’s suitable not only for picnics, but also for other outdoor activities like skating and jogging. Its fields are large and sprawling, so if you just want to sit down and relax, that’s fine, too. It’s also got cycling plazas for adults and children; a pond with some fountains; a bird sanctuary; a sample garden which was formed thanks to the contributions of 22 participant countries during the Tokyo Olympics; rose, cherry, and plum gardens; and an observation deck from which you can see the entirety of the forest area. As for flora, Yoyogi Park’s is honestly not that special or scenic compared to that of other parks. It’s not so much known for the beauty of its trees and blossoms; it’s better known for being a park that’s bustling with activity. However, Yoyogi Park does have some cherry blossoms—it has around 500 Somei-Yoshino cherry trees, and also some kawazu sakura—early-blooming sakura—trees. 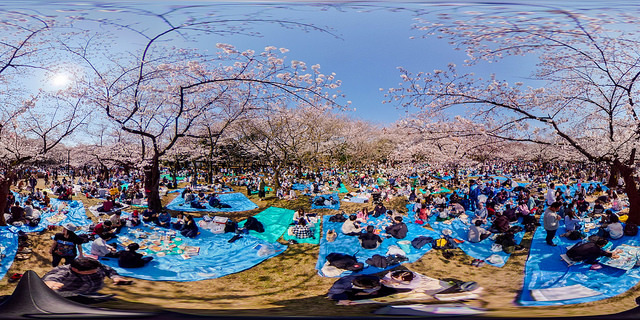 While it’s not exactly known as a hanami spot (other parks easily beat Yoyogi Park in that regard) it’s not unheard of to have hanami picnics there. The Japanese zelkova, though, is the tree that’s in most abundance in the park. The other side doesn’t really have much flora; again, it’s better known as an event venue. Usually, you’ll see cultural events and/or flea markets there, as well as food stalls. That side also has an athletic field, soccer and hockey field, and basketball court. It’s also quite close to the NHK Broadcast Center. There’s almost always something happening in Yoyogi Park. 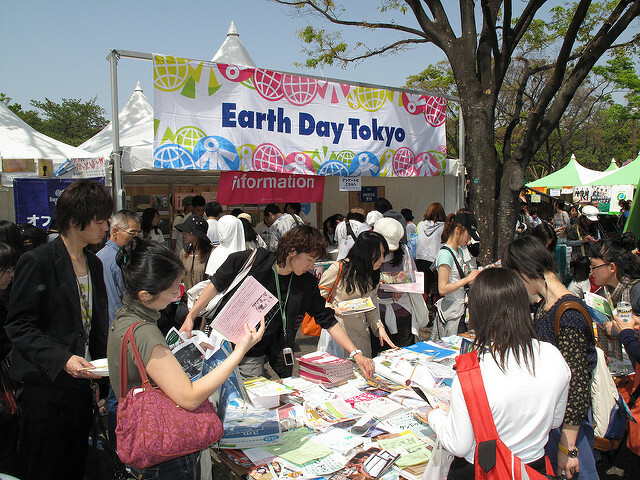 The park has had celebrations such as Outdoor Day, which, as the name implies, encourages people to spend more time outdoors; Earth Day; and, just recently, Tokyo Rainbow Pride, which even featured a pride parade. Many Yoyogi Park events are about getting a glimpse of other cultures, though. And we’re not just talking about international cultures—many of Japan’s other areas have their own distinct culture and traditions, too! Without leaving Tokyo, you can sample some regional and international cuisines and maybe even try some cultural activities at such events. Just some of Yoyogi Park’s cultural events held in recent years are St. Patrick’s Day in March; Songkran Festival (a general celebration of Thai culture—though, it doesn’t really resemble the actual Songkran event) and Cambodian Festival in April; Cinco de Mayo, Okinawan Festival, and One Love Jamaica Festival in May; an ASEAN Festival in June; a Brazilian Day and Indonesian Festival in July; a Latin American/Caribbean Festival in August; Vietnam, Indian, and Sri Lankan festivals in September, and more! In fact, some countries like Thailand even hold multiple events throughout the year. These events are usually a huge hit with visitors, and the lines at the food booths can get rather long. With all these events, Yoyogi Park is rather international and if you are looking to enjoy international events or make friends from other countries, this is a good place to go to! Always open, with no closing days. Located near the JR Line’s Harajuku or Yoyogi Station, or Tokyo Metro’s Meiji-Jingumae Station, Yoyogi Park is one of Tokyo’s largest parks at 54.1 hectares.